Tractor and trailer tires are among the most expensive items truck drivers buy. Next to fuel, there may be nothing else in the trucking industry that consumes so much of a trucker’s financial resources. So it’s important that drivers do what they can to maximize tire life. Otherwise, it is like throwing money away. Truck tires are subject to a lot of punishment capable of significantly reducing their useful life. Here at Mytee Products, we want our customers to get maximum life from every tire they purchase. To that end, we offer drivers five practices for doing so. Each of these practices should be held to religiously. If you have heard it once, you’ve heard it a thousand times: it is critical to maintain proper air pressure in both tractor and trailer tires. Air pressure is the single most important component in maximizing tire life. Tire pressure is measured in terms of pounds per square inch (psi). The larger the tire, the lower the number. If you are a truck driver, do you know what the PSI reading for your tires is? You should. Furthermore, you should be checking tire pressure on a regular basis. At least once per week is the bare minimum. Tires with incorrect air pressure will wear more quickly and use more fuel. They are also subject to blowouts. Furthermore, under-inflated tires can wear out in such a way as to make retreading nearly impossible. That means those used tires will be worth less in trade when a driver purchases a new set. Stem valve caps were not designed for aesthetic purposes. They were designed to be the last line of defense against losing air. The reality is that a stem valve can never be 100% airtight, so the cap adds a little bit of extra protection to prevent air leaks. Make a point of replacing stem valve caps whenever you discover them missing. Tire rotation is not just something car owner should do; truck drivers should be rotating their tires as well. The point of rotating tires is to make sure they wear more evenly. This extends life, maximizes control, saves fuel, and more. How often should tires be rotated? Whenever a truck is undergoing routine maintenance. A competent garage will know which tires to rotate and the positions to put them in. Federal law requires truck drivers to check their tires as part of their pre-trip inspections. The point should be obvious: they do not want trucks hitting the roads if their tires are unsafe. To the truck driver however, there is an added benefit of routine inspections. Checking tread and sidewall condition on a regular basis keeps drivers abreast of how their tires are holding up. Regular tire inspections make it more obvious when tires are under-inflated; they make it easier to identify small issues before they become big ones. Lastly is checking tires for the unexpected. This goes hand-in-hand with daily tire inspections. What do we mean by the unexpected? The unexpected involves things like minor damage from running over road debris or maybe finding objects lodged between the wheels at the end of the day. Identifying the little unexpected things can mean the difference between tire failure and maximizing tire life. Take care of your tires and they will take care of you. And when you get ready to buy new tires, remember that Mytee Products has what you need for both tractor and trailer. We take trailer loading ramps for granted. In other words, we just assume that a good set of ramps is going to do the job without issue. We usually don’t give any thought to how they actually work, or how they make our lives easier for that matter. If we did, we would be delving into all sorts of things related to physics. As human beings, we are capable of using tools to do all sorts of work. Trailer loading ramps are just one example. When you understand the physics behind how these ramps work, you come to appreciate how much they enable us to do. There are plenty of loads truckers could not carry if it were not for the work done by loading ramps. The trailer loading ramps we sell are intended for both straight flatbed trailers and those with multiple deck levels. They affix to the back of the trailer using clips to hold them in place. On the other end, wedges make the transition from ground to ramp a smooth one, allowing operators to easily drive or push cargo up onto the trailer. We will not get into all the physics of using trailer loading ramps, but we do want to cover some of the basics. The first thing to talk about is how ramps make it possible to load extremely heavy cargo on the back of a flatbed. Imagine a trailer carrying a heavy piece of construction equipment. Without loading ramps, that piece of equipment would have to be lifted onto the trailer using a crane. Why? Because it takes a tremendous amount of force to overcome gravity when lifting an object by pulling it from above. All that dead weight requires a heavy-duty crane to get it off the ground. Furthermore, greater downward force is exerted on the object the higher it goes. Using loading ramps still require some amount of force to get the piece of equipment onto the trailer. But rather than pulling it straight up, the operator is moving the equipment across an inclined distance. Spreading gravitational force across a surface plane at distance allows the operator to more easily overcome that force at any given point during travel. The result is less energy required to move the same object. While the force and distance equation is the key equation for trailer loading ramps, there are other physical forces in play. For starters, you have both the potential and kinetic energy stored in the piece of equipment being loaded. That energy affects how the cargo is moved. Kinetic energy is energy in motion. It puts increased stress on the ramps the further up the piece of equipment goes. Combined with gravitational energy, kinetic energy also puts stress on the rear of the trailer. That’s why ramps have to be firmly affixed and trailers have to be locked in position. Potential energy is stored energy. It exists in the piece of equipment even as it is moving up the ramps. If one of the two ramps are unsteady, that potential energy could be transformed into kinetic energy, causing the piece of equipment to tip and fall off the ramp. Rest assured that engineers work out all the physics before attempting to load a piece of heavy equipment onto a trailer. Operators know the size of the ramps they should use, how to anchor the ramps in place, and how to actually move equipment up those ramps. If it weren’t for physics, none of it would be possible. The headache rack is one of those pieces of equipment with a very descriptive name suggesting just how important it is. It protects the backside of a tractor cab against cargo that might shift forward on a flatbed trailer. Truck drivers do everything they can to prevent cargo shifting, including securing their loads with chains and straps, but sometimes things happen. The headache rack is there as an added layer of protection when something does go wrong. 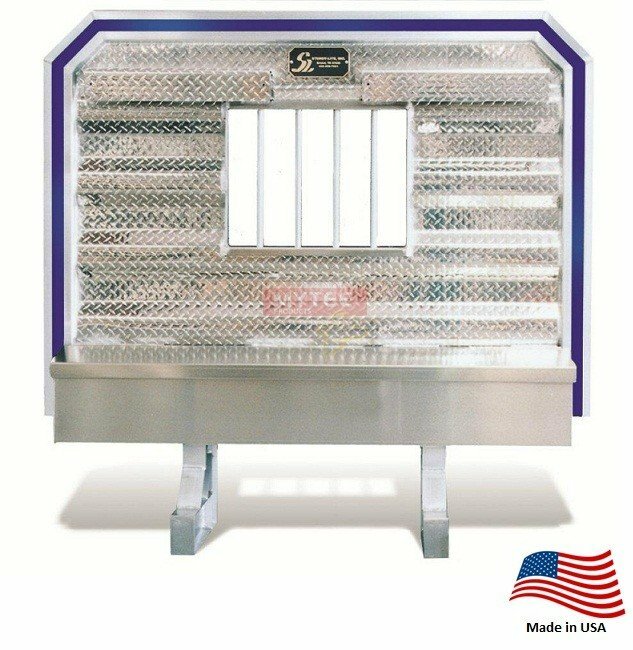 Your standard headache rack is made of a premium, high-strength aluminum alloy. It can be as simple as a rectangular panel attached to two mounting arms that are then affixed to the frame of the tractor. Once in place, this seemingly simple piece of equipment can end up being a lifesaver. But here’s the thing: headache racks serve multiple purposes. The beauty of headache racks is that they are versatile as well as being sturdy and protective. For example, just about every flatbed trucker in the country has used a headache rack to store chains, bungees, and straps. Some have built-in toolboxes because, as truckers know, you can never have enough storage space. One of the things we enjoy about working with the trucking industry is seeing how creative drivers are with their equipment. We see a lot of interesting things with headache racks. For example, we had a trucker stop by our Aurora, OH retail location to pick up some tarps and straps. On the back of his tractor was a typical headache rack you wouldn’t think much about under normal circumstances. But on this day, something was different. On top of his headache rack was a custom-made bike rack. That’s right, this trucker mounted a bike rack on top of his headache rack so that he could take his bike with him. We assume he used the bike for exercise and leisure. Regardless, utilizing the headache rack to carry his bike was an ingenious use of a little bit of space that would otherwise go to waste. Another ingenious use of the headache rack is storing a ladder or two. This is actually pretty common. Truck drivers can use foldable aluminum ladders to make it easier to work on their trucks, secure unusually high loads, and so forth. But if you are going to carry a ladder on board, where do you put it? Attaching a ladder frame to the headache rack is the perfect solution. The frame is attached to the aluminum plate; the ladder folds up and attaches to the frame during transport. One of the most common strategies for headache rack modification is adding toolboxes. Mytee Products carries three models with toolboxes already built in, but we know there are truckers who prefer to purchase a basic headache rack and build their own toolboxes to go with them. Toolboxes are like gold to truck drivers. They can never have too many. As for the headache rack, most flatbed drivers are never going to have an incident requiring it to save their lives. They invest in the headache wrack just in case they need it. Assuming the need will never arise, truck drivers might just as well utilize the extra space the headache rack affords. That’s where built-in toolboxes come into play. The utilitarian headache rack provides extra protection against shifting cargo. It is foolish to not have one. But a good rack is a lot more versatile. The most creative truck drivers do some pretty interesting things with their headache racks. We have seen just about everything here at Mytee Products.